The Fourth edition of Database System Concepts has been extensively revised from the 3rd edition. The new edition provides improved coverage of concepts, extensive coverage of new tools and techniques, and updated coverage of database system internals. This text is intended for a first course in databases at the junior or senior undergraduate, or first-year graduate level. 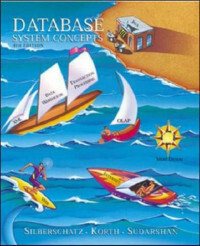 Database System Concepts, 4th ed. offers a complete background in the basics of database design, languages, and system implementations. Concepts are presented using intuitive descriptions, and important theoretical results are covered, but formal proofs are omitted. The fundamental concepts and algorithms covered in Database System Concepts 4th ed. are based on those used in existing commercial or experimental database systems. The authors present these concepts and algorithms in a general setting that is not tied to one particular database system. Manage your business documents with version control, library services, content organization, and advanced search.